Obituary – McGill, Duane Paul « Perry High School Alumni Association, Inc.
﻿Former Perry resident, Paul McGill, 57, West Plains, Mo., died at 12:50 a.m. Sunday at Baptist Medical Center at Oklahoma City. Funeral will be at 10 a.m. Tuesday at Brown Funeral home chapel with Dr. Charles Sapp, pastor of the First United Methodist church, officiating. Burial will be at Grace Hill cemetery. Memorials may be made to the American Cancer Society. 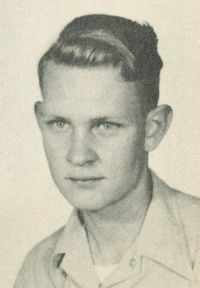 McGill, the son of Carl and Blanche McGill, was born at Perry, Nov. 4, 1927. He was a graduate of Perry high school. He served in the Navy during World War II and was a 34-year employee of Southwestern Bell Telephone when he retired four years ago. He and Gladys Chesler were married Nov. 23, 1968, in Oklahoma City. McGill was preceded in death by his first wife, Bertha, and his father. Among survivors are Mrs. McGill, of the home; three daughters, Janet Ewing and Kathleen Greeson, both of Oklahoma City; and Diane Britton, Yukon; two sons, Duane Paul McGill II, Moore; and Richard Chesler, Oklahoma City ; one sister, Glenna Davis, Albuquerque, N.M.; a brother, Gordon McGill, West Plains, Mo. ; his step-father and mother, Mr. and Mrs. Eddie Gallup, West Plains; and four grandchildren.